Of course that is the perspective of a true bike snob, for hybrid bikes are in fact the ideal machine for someone who is not prepared to invest a ridiculous proportion of their income on two-wheeled equipment for their leisure. And for me, as a confirmed crossista, and one who has not owned a mountain bike for about 20 years and a road bike for only a few out of those 20, I have always secretly liked the simplicity of a do it all bike - one that can perform well across more than one chosen discipline - road, cross and even mtb style terrain. The concept of hybrid then for me, is one of semantics and snobbery, for in fact I am indeed always looking for that ideal multi-purpose machine. I've ridden my cross bikes on the road for ages now, not really a major imposition since i don't road race, crit race or time trial out of choice. I find a cross bike excellent for both short and long road rides, comfortable and reliable, if slightly aesthetically challenged when shod with thin clincher wheels. For sure, they lack the out and out climbing prowess of a shorter wheeled road bike, or the the high speed cornering of a crit bike. But for an average punter like me, that's fine. It was with interest then, that I stuck some skinny road tires on the wide rim 29er clinchers that come with the On One Dirty Disco Rival build and headed for a play on the roads. 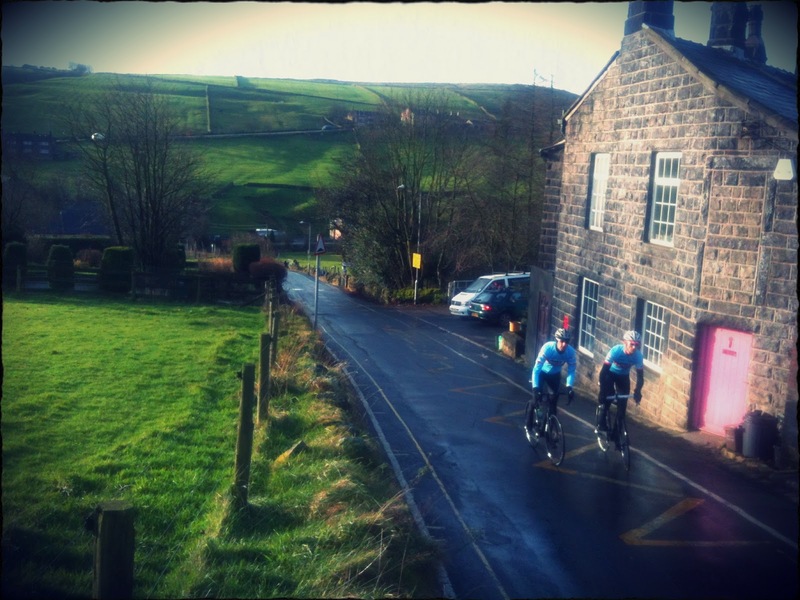 Unable to do anything Disco related without stalking newly signed On One rider, Dave Haygarth, I gatecrashed his day-off morning ride round Calderdale to see how much my enthusiasm for the offroad antics of the Disco would crossover. Dave entered into the spirit of the occasion with his own slicks on one of his Discos. To an outsider there’s little difference between a cyclocross bike and a road bike. Many people actually buy them as ‘all round’ bikes to deliberately ride as touring or commuting bikes. It’s not hard to see the logic – they’re comfortable and a little more forgiving than a steeper angled road bike with more clearance. The modern ‘cross bike has moved nearer and nearer to a road bike with racier geometry and stiffer materials, so it makes sense in a way to give it a go. The improvements in ‘semi’ mudguards also means that mudguard eyelets and stays aren’t needed. My pair of quick ‘snap on’ race guards meant I was ‘comfortably dry’ over the less-than-dry moors and valleys.The first thing I noticed was how far ahead the front wheel felt when riding on familiar roads. It looks and seems a long way away despite the fairly steep head angle on the On OneDirty Disco I ride. This translates in to that bit more comfort on the road. A couple of cm on the wheelbase of the bike – particularly in winter – gives a more forgiving ride. Other than that it felt pretty much like a very responsive and easily controlled road bike. It’s amazing what a hard pair of 23mm slicks can do to the bike that chews up the dirt at the weekends. I'm not going to add to that really - I too loved the chunky feel of the Disco. It's off-road performance translates nicely to the road to give a comfortable and responsive ride, as Dave says. Which let me to ponder..... would the Disco make a good sportive bike in the summer before being returned to cross duties in the winter? For me, not overly drawn to a high end road bike, the answer is definitively yes. It has double bottle cage mounts to help seal the deal. And could it moonlight as a fast commuter too, given the ability to fit removable mud guards? I would say so.